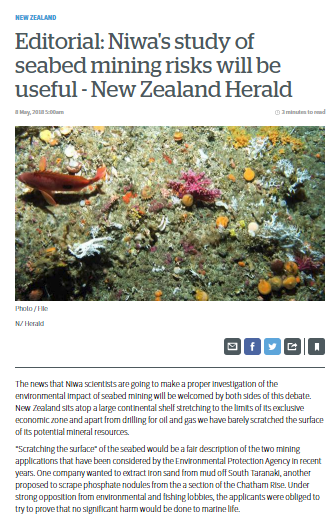 NZ Herald reports on a MBIE funded study on the effects of seabed mining to be conducted by NIWA. Kiwi scientists investigating the impacts of controversial seabed mining are about to simulate the effects themselves, in one of the most challenging underwater experiments Niwa has ever attempted. Only two seabed ventures have ever been developed in New Zealand and both have been met with staunch opposition. That was amid concern the operations would disturb sea life at their operation sites - and more widely through drifting plumes of sediment and other environmental effects. CRP CEO Chris Castle was recently interviewed by Wim Sanders of SmallCAPS US. Please note that the SmallCAPS website requires a Flash capable browser to play the interview. In addition, SmallCAPS US has published a dedicated company page on CRP that includes a brief intro, an overview of our latest Press Releases and all our updates. Chatham Rock Phosphate Limited (TSXV: NZP, NZAX: CRP) aims to be the premier supplier of direct application phosphate to the New Zealand and global agricultural sector. Chatham Rock Phosphate is the custodian of New Zealand’s only material resource of ultra-low cadmium, environmentally friendly pastoral phosphate fertilizer. Chatham Rock Phosphate Ltd holds a mining permit over an area off the coast of New Zealand, with significant seabed deposits of rock phosphate and other potentially valuable minerals. We learned from Chris Castle, President, CEO and founder of Chatham Rock Phosphate, that their deposit is offshore about 450 KM to the west of New Zealand, 400 Meters under the water. The resource is 35,000,000 tons, of which 23,000,000 are 43-101 compliant, which makes for a 15-20 year mine life. Chatham Rock Phosphate anticipates significant return on investment. According to Mr. Castle, their New Zealand project has quite a number of environmental benefits, including lesser carbon emissions, better water quality, and low levels of cadmium. We are featured in this month’s issue of Resource World Magazine, see page 46. Chatham Rock Phosphate features in an article in the morning business news on Radio NZ following a recent positive EPA decision for Trans-Tasman Resources. Chatham Rock Phosphate CEO Chris Castle, was interviewed on Radio New Zealand regarding the recent EPA decision, and CRP's proposed Chatham Rise phosphate project. WELLINGTON New Zealand – Chatham Rock Phosphate Limited (TSXV: “NZP” and NZAX: “CRP” or the “Company”) notes the halting of a second phosphate shipment from the Western Sahara is intensifying the supply risk for New Zealand farmers. Chatham Chief Executive Chris Castle said today the need for New Zealand to secure its own low cadmium and ethical phosphate resource is highlighted by news Panama authorities have detained Moroccan phosphate shipment from the Western Sahara after the Polisario independence movement claimed the cargo had been transported illegally. The detention of the vessel carrying phosphate rock cargo from Morocco’s OCP for Canada’s Agrium is the second tanker stopped this month by a Polisario legal challenge, a new tactic the independence movement has been using in its conflict with Morocco. The first shipment was detained in South Africa. Western Sahara has been disputed since 1975, when Morocco claimed it as part of the kingdom and the Polisario fought a guerrilla war for the Sahrawi people’s independence. Both New Zealand fertiliser manufacturers source a large part of their phosphate rock supply from that area, so the implications for farmers and the economically important agriculture sector are serious. Mr Castle said the company’s Chatham Rise resource is not only an ethical source but it also has among the lowest known levels of cadmium. “New Zealand needs to use its own source of ethically-produced, environmentally-friendly phosphate rock rather than importing product from a disputed territory. “Phosphate is essential for the production of food and we can’t afford supply disruptions. This underlines the strategic value of our deposit. Mr Castle said Chatham’s product is also better for the environment as it binds to the soil and dramatically reduces run-off to waterways. He said the rock from Morocco is used to make New Zealand’s predominant fertiliser superphosphate, which results in high levels of run-off with resulting pollution to our waterways and can also be detrimental to soil health over the long term. “The solution to supply and environmental problems is the use of Chatham rock phosphate as an organic direct application fertiliser not processed with chemicals. “We can deliver a secure and sustainable local supply of low-cadmium phosphate that will also reduce fertiliser run-off into waterways, produce healthier soils and shrink fertiliser needs over time,” Mr Castle said. The Chatham Rise resource represents one of New Zealand’s more valuable mineral assets and is of huge strategic significance because phosphate is essential to maintain high agricultural productivity. Chatham proposes to extract up to 1.5 million tonnes a year of phosphate nodules from the top half metre of sand on identified parts of an 820km2 area on the Chatham Rise, 450km off the west coast of New Zealand, in waters of 400m.